Red Horse Ranch is a beautiful, family style, safe home for your horse at an affordable price. Finally, horse boarding with no nonsense. Our friends call our place "the no rib ranch" because of the beautiful and healthy condition of the horses. All horses have round the clock nutritionally balanced Coastal hay from Escondido Farms in Devine, TX. Full board starts at $395.00. per month with some special care options available. Horses have large pens with plenty of room to run and play with lots of trees for shade and large run in barns. We have a lighted round pen, an arena, wash stands, nice tack rooms, trailer parking and best of all, miles of great trails! If you've been searching for a BIG DIFFERENCE in horse boarding facilities you will definitely want to visit Red Horse Ranch. Dave and Lisa Bierbower personally care for all of the horses! 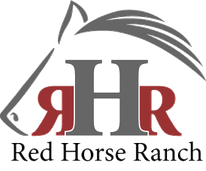 Red Horse Ranch has great horse folks, lots of fun and is a great home for your horse. Please call or email to schedule a tour today!